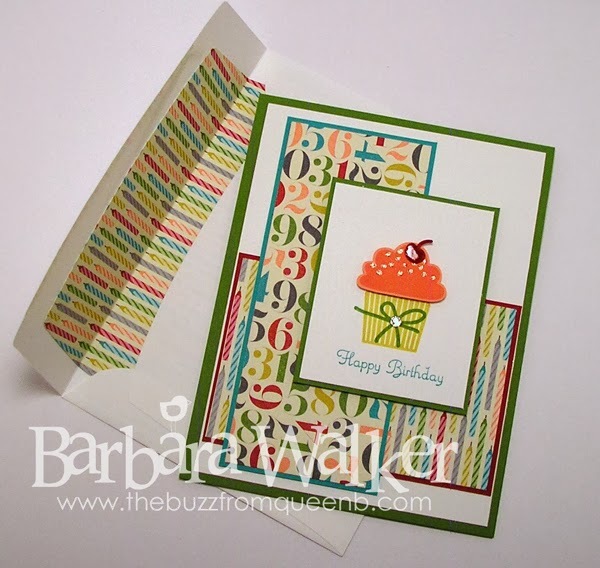 The Buzz: Birthday Card Blitz! Hello Friends! Happy Monday! I've got more birthday cards to share today. I bought this fun Designer Series Paper pack from Stampin' Up! called Birthday Basics and that's what started it all. I just got so taken with the all patterns and colors in this pack. I grabbed a few stamp sets and some ink and got busy...Let me show you what I created! For this first card, I stamped the image and then colored it with a blender pen and inks. I dusted distress ink around the image while it was still in the die. On the card base, I used the Let It Snow! stamp set from Lawn Fawn to create that confetti look. I stamped it in Versamark and then embossed it with iridescent embossing powder. It's a really cool effect in real life. Maybe you can catch a glimpse of it, by clicking on the image and enlarging it. The next two cards are very similar; same papers and stamp set. One thing I really appreciate about Stampin' Up! is that their products are so well coordinated. I just used the one paper pack, pulled the card stock and ink colors right from the dsp and I was ready for my card making session. I really like the cupcake builder set, because all of the components are individual stamps, it makes it easy to use different colors for each element. I used Glossy Accents on the cherry for cupcake #1 and on cupcake #2, I punched the flame out of gold glitter paper. And then as a finishing touch, I created liners for my envelopes. I just love that candle paper! That's all I have for today. I thank you so much for stopping by! I hope you are having a wonderful weekend! supplies ~ Most are from Stampin' Up! Others are noted. Fantastic cards, Barb!! The colors in the papers are so pretty and festive. On the first one, I really like that sparkly embossing powder you used. Each of the cupcakes look scrumptious. I really like how you line your envelopes, too. Great job!